Endless rotations. Spin Spin Spin…. It’s all in the Spin! This little ‘Wonder’ offers an exceptionally smooth rotation on 2 different axes. 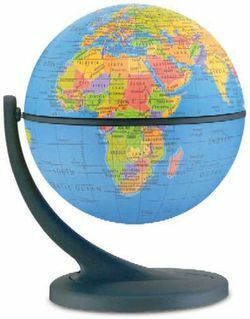 The 11 cm diameter globe features a detailed easy-to-read map indicating political borders and capital cities. Teachers, corporate executives, and children of all ages will enjoy hours of learning while experiencing the amazing dynamics of this wonderful globe.